Important takeaways from coverage of the Boston Marathon coverage was one of the big media stories of 2013. Image by TTNHDProductions on Flickr and used here under Creative Commons. Click the image to read the entire series! A big year for both breaking news as well as shifts within the industry, 2013 saw its fair share of massive media stories. The biggest of all were the revelations about NSA surveillance from a leaker, Edward Snowden, who surprised everyone by exposing his identity. And that followed the Obama Administration’s push to prosecute journalists, snooping on phone records from the AP and beyond. And then, the horrific Boston Marathon bombings played out on social media and Reddit, making us rethink ethics and the truth. While the NSA revelations sparked advocacy for more free speech and transparency reporting, the bombings taught us lessons about accuracy and trust online. "We also learned from big stories like the reveal of the NSA suveillance and the Boston Marathon bombings, both of which forced the media community to look back at core ethics. " And it’s no surprise that print is still under pressure from the digital shift, but we saw other facets of this effect this year through its impact on hyper-local news and alt-weeklies. 2013 was also a year for big business news that also caused ripples in the media industry. From Twitter’s IPO to Jeff Bezos buying the Washington Post to Yahoo’s acquisition of Tumblr, we saw how ownership could shift thinking at various media properties. Here’s our list of the top 10 media stories of 2013. Did we miss anything? Share it with us in the comments below. The biggest exposé since WikiLeaks’ War Logs, the revelation of broad NSA surveillance techiques took the world by storm. Upon the first publication of documents leaked by ex-NSA contractor Edward Snowden in June, government surveillance around the world became a hot topic for the rest of the year. Image by ubiquit23 on Flickr. Licensed under Creative Commons. The documents revealed that the NSA was collecting information from Verizon customers, regardless of whether they posed a threat. The surveillance effort also is happening worldwide, as many international organizations transferred massive amounts of data over to the NSA. And the effort was in collaboration with top tech companies such as Microsoft, Yahoo, Google, Facebook, AOL, Skype, YouTube and Apple. In the midst of this public outrage, Snowden — marked as both a traitor and a hero of free speech — fled to Russia, complicating Russian-American relations even further. Those supporting Snowden generated a new wave of free speech advocacy to protect those working in transparency journalism. Furthermore, in December, eight tech giants came together to create Reform Government Surveillance, a plea for the government to change its spying laws in favor of more privacy for their users. In December, a federal court ruled NSA’s bulk collection of phone records was likely unconstitutional, finding that there was a lack of evidence that the surveillance actually stopped terrorists. Prediction: The NSA’s surveillance techniques will continue to be a talked-about topic in the new year as the current situation is still in flux — and Snowden has many more documents to reveal. Snowden might end up getting asylum in Brazil or another country, and the U.S. Congress could enact more laws regulating the NSA’s practices. 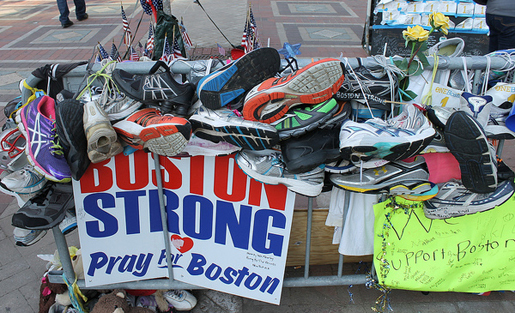 When tragedy broke at the 2013 Boston Marathon in April, both journalists and citizens alike scrambled to find answers. In the age-old battle between speed and accuracy, the ethics of the coverage became big lessons and sparked discussions for journalists worldwide. In a local event such as the Boston Marathon bombings, many relied on local, on-the-ground sources for up-to-the-minute updates. Many of these, however, were taken for granted. In a discussion hosted by the Nieman Lab at Harvard University, speakers lauded the use of social media in such a frenzied state as both a way to keep others updated as well as a manner for journalists to document primary source material for later writing. Accuracy is rule number one in credible journalism. Legacy organizations incorrectly reported a suspect’s arrest. Some speculated about his race and ended up being incorrect. These reports reflected a failure of basic journalism accuracy. General references to race or ethnicity that single out groups of people — and that don’t tell us much about the suspect — stir anger and fear. Prediction: As social media and citizen reporting becomes more prevalent and natural, expect more examination of the impact it has in the long haul, especially in the event of tragedy and confusion. And in the heat of the moment, some news sources might hold back until they get information verified, rather than relying on hearsay to be first. Jeff Bezos. Image by niallkennedy on Flickr. Licensed under Creative Commons. On Oct. 1, Amazon CEO Jeff Bezos sealed the deal to buy the Washington Post for $250 million. In a digital age when many are worried about the death of print, Bezos’ move could be a game changer for the industry. Although some worry about whether Bezos will value a business model over news integrity, there are still others who believe Bezos will change the print landscape. Amazon, a modern digital success story, took full advantage of the web and ran with it. Many believe that Bezos may take the expertise he learned from Amazon to revive the Post. With more audience targeting and smart advertising via a push for digital media, Bezos may help figure out a business model for newspapers in the digital age. Bezos also represents a new wave of media moguls, one that includes eBay founder Pierre Omidyar, who reportedly looked at the Post before choosing to start up his own operation with Glenn Greenwald. Other print-minded billionaires include Boston Red Sox owner John Henry, who bought the Boston Globe, and financier Warren Buffett, who’s been amassing quite a number of newspapers. Prediction: Newspapers finally have their white knights. The problem is, will the white knights be thwarted just like all the others who have stepped in to save newspapers? Or can these titans of tech bring digital knowledge to the fore to solve legacy issues in the business? Most likely, their success will be mixed. The social media world was ablaze as Twitter issued its initial public stock offering in November. Closing its stock market debut day at $44.90, nearly twice as much as its original offering price of $26, $TWTR shares rose handsomely. Twitter learned the lessons of Facebook’s face-plant IPO, and made sure the offering went off without a technical hitch. The company has made many moves into the TV business, and has had solid mobile revenue growth — though it still loses money. What does this mean for the average Twitter user? The shift signifies that Twitter has grown out of its startup roots and is a full-blown media company. It could mean that there will be more advertising in your Twitter feed, and we’re already seeing this with its new full-sized image functionality. Plus, Twitter’s direct messages now allow you to sendphotos, another possible plus for marketers. 2013 also saw native advertising take hold of the industry and raise big questions over how to define, measure and regulate the practice. As the power and popularity of the banner ad continued to decline, marketers looked for better ways to reach consumers and had strong success with marketing content that folds more seamlessly into the editorial content around it — whether that’s in the form of a viral video or a branded article. In 2013, we saw publishers race to offer these types of advertising options, with some setting up or expanding their own in-house shops devoted to creating the content. According to a survey from the Online Publishers Association, 73 percent of its members were offering native advertising options mid-year with the possibility of that number reaching 90 percent by year’s end. In December, the conversation over native advertising really heated up when the FTC hosted a workshop on the issue and the industry tried to get ahead of possible federal regulation by rolling out guidelines of its own to help self-police native advertising. An ancillary trend was the rise of branded content in 2013. Brands are finding innovative ways to reach out to their target audience, and most are looking to creative and original methods that stray away from traditional advertising. As the modern consumer becomes more and more wary of corporate advertising, brands need to find new ways to regain the trust of the customer. Examples of branded content include creative films, from Chipotle’s much lauded (albeit controversial) “Scarecrow” ad to Intel’s “The Power Inside” series, the social crowd-sourced followup to their “Beauty Inside” series from last year. Furthermore, brands took full advantage of social media from Oreo’s timely Superbowl blackout tweet to GE’s #6secondscience campaign on Vine. Prediction: Native advertising will continue to spread, but more stringent guidelines or regulation, either at the hands of the industry or the Feds, is likely to happen in 2014. And brands will continue to explore more outlets for branded content. When Condé Nast announced in October it would end its internship program starting in 2014, the case against unpaid internships opened up yet again. Not entirely breaking news, unpaid internships have been a controversial topic for the past couple of years. However, it was the media company’s big decision that sparked another big conversation this year. The ordeal began in June when two former Condé Nast interns sued the company for failing to pay them minimum wage at their respective internships. Following the case of an unpaid intern suing Hearst in 2012 and a case ruled in favor of unpaid interns against Fox Searchlight Pictures, Condé Nast decided to completely cancel its internship program with its own case still pending. Prediction: Even though Condé Nast is a cornerstone of the media industry, we don’t see many other student internships in jeopardy. In fact, these cases might be a warning sign for other unpaid internships to cease while employers introduce more paid opportunities for students. With Marissa Mayer at the helm, Yahoo has seen some big changes that have helped it gain much needed buzz and relevancy. In May, Yahoo closed a deal with Tumblr, acquiring the social blogging platform for $1.1 billion. The acquisition follows close on the heels of Facebook’s $1 billion deal to buy Instagram in 2012. Marissa Mayer. Image by jdlasica on Flickr. Licensed under Creative Commons. Tumblr’s young and engaged user network could help breathe life into Yahoo’s aging demographic. While one of the biggest reservations users had was how an old tech institution like Yahoo would change Tumblr’s dynamic culture, Mayer vowed to “let Tumblr be Tumblr,” but not without adding some new built-in monetization in the form of ads. In the trend of acquiring rapidly growing tech startups, Facebook unsuccessfully tried to acquire Snapchat as the latter turned down a $3 billion offer from the former. Not to be outdone, Facebook immediately responded with Instagram Direct. While this might mitigate the leverage Snapchat originally had, this doesn’t mean that small tech startups are any less enticing than before. Prediction: Larger tech and media companies will continue to look to the pool of rising startups for promising acquisitions. However, Snapchat’s refusal of Facebook’s offer could lead other startups to continue on their own as well, and perhaps we’ll see another wave of tech IPOs in the new year. The downsizing of AOL’s Patch outlets was another horror story for hyper-local news (especially the large network variety). The news came in early August when AOL announced it would shut down 300 of its Patch sites, nearly a third of its nationwide network. AOL headquarters made the abrupt announcement, citing the inability of these 300 sites to draw in enough traffic and attract enough revenue. In addition to laying off 40 percent of its Patch workforce, AOL also laid off many employees at its headquarters, including CEO Tim Armstrong’s infamous leaked conference call to the entire company in which he fires Patch creative director Abel Lenz. AOL’s drastic cuts were not surprising. The company was losing close to $300 million with Patch, and it was hard for AOL to keep the large network afloat. It’s also hard to control such a large network of local sites with a remote headquarters at the helm. While the New York Times’ David Carr reported recently that Patch would likely close or be sold off, Armstrong and Co. continued to deny that was happening, saying that better days are ahead. Prediction: Even though Patch is going downhill, there will always be a need for hyper-local news. Those sites will likely be done locally and not in large nationwide networks. We’ve already seen the failure of similar efforts before from Microsoft Sidewalk, CitySearch, Backfence, et al, so finding the network effect in hyper-local will continue to be difficult. In March, the Boston Phoenix, one of the biggest alt-weeklies in the nation, folded after 47 years. Just half a year before its goodbye, the alt-weekly had transformed itself from a newspaper to a magazine, an effort that proved not enough to save the publication. The announcement follows the closing of its sister radio station, WFNX, in 2012 as mass media company Clear Channel bought the alternative rock station. Image by BartEverts on Flickr. Licensed under Creative Commons. With an estimated $1.2 million in debts, the Boston Phoenix isn’t the only alt-weekly that suffered in recent years. In 2012, the Chicago Sun-Times bought the Chicago Reader, another main player in the alt-weekly landscape, for about $3 million. The alt-weekly, coming off of its golden age in the ’70s and ’80s, is another victim of the lack of classified ads. With the advent of Craigslist, Yelp and other mobile sources for local news, the alt-weekly format suffered. Jack Shafer of Reuters also cites smartphones as a killer of the alt-weekly. Whereas before commuters would pick up alt-weeklies and dailies while they wait for the train, the smartphone can offer all of that information and more. Prediction: Of the remaining alt-weeklies, it’s important that they seek out other sources of revenue and move very quickly into digital and mobile. Shafer points to the partnership that the Austin Chronicle has with the SXSW festival that allows the paper to still thrive and keep its audience. Both Vine and Instagram came out as fresh and innovative ways of delivering news this year. Twitter-owned Vine, officially launched as an iOS app in January, gave video a new place in social media. By condensing video into six-second, bite-sized pieces and its own social media platform, Vine allowed anyone to easily take video and share it with a group of people. This sparked Instagram to follow suit with its own version of Instagram video, taking advantage of the app’s already large user-base. With video integrated into these two tools, we saw the rise of social, multimedia storytelling, especially in citizen journalism. The Boston Marathon bombing was an example of how witnesses could easily take at-the-source video with Vine and share it instantly to spread breaking news. Prediction: Vine, Instagram and other mobile apps will continue to be avenues for citizen journalism and breaking news, as well as interesting ways for news organizations to easily share news with their audience. Additionally, there will be more experimentation with mobile storytelling and many, many more apps to explore. Photo illustration for our series image by wildfox76 via Flickr Creative Commons. Edward Snowden is a criminal and will be brought back to this country to stand trail for treason? THAT IS WHAT HE DID. Stop treating him like a hero, he is at best a traitor, at worst a terrorist.